Our setback this week involves the scuttle. 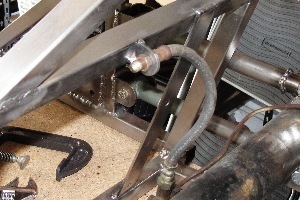 The scuttle is attached to the frame with 8 steel tabs. 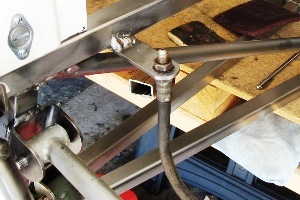 Each tab is welded to the scuttle on one end, and bolted to the upper frame rails on the other end. To bolt anything to a frame rail you need to insert a rivet nut, a collapsible tube with a flange on one end and threads on the other. It's not really as complicated as it sounds, and anyway it's beside the point. The important thing is, the rivet nuts we bought had threads for a 1/4" bolt, and the tabs that we spent many hours making were drilled for 5/16" bolts. We could waste a lot of time arguing about whose fault that was and not get anywhere, so instead we just made some more tabs. Installing them was pretty straightforward. 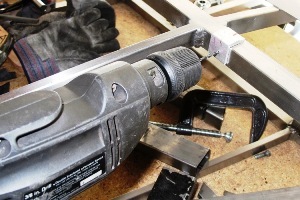 We first drilled the frame rails for the rivet nuts, using a makeshift jig to get the holes all even. Then we squeezed in the rivet nuts and bolted on the 8 tabs. 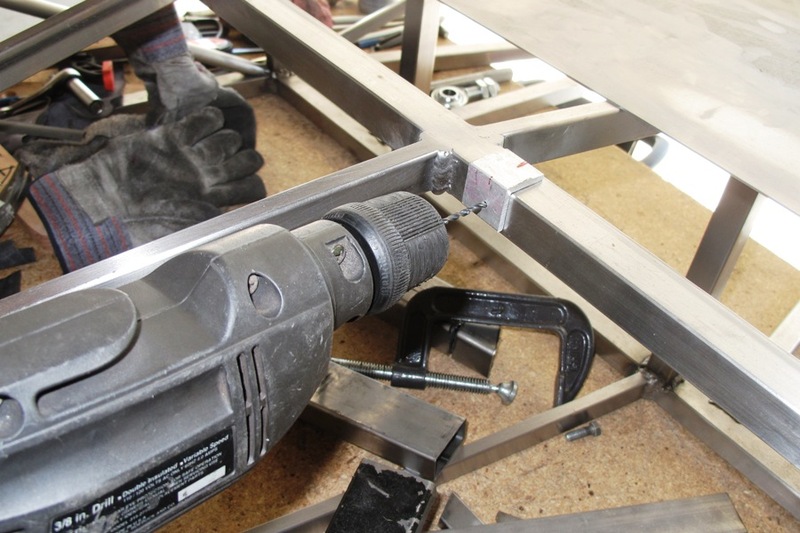 We then clamped the scuttle in place and welded the other ends of the tabs to the scuttle. All of this went amazingly well, and we're now done with the scuttle until someday in the future when we need to add a dashboard. Fresh off that success, we decided it was finally time to weld on the tabs that attach the ends of the flexible brake lines to the frame. We made these tabs a while ago, but we'd been avoiding welding them onto the frame because we weren't exactly sure where they needed to go. Welding, as you know, is something of a commitment. 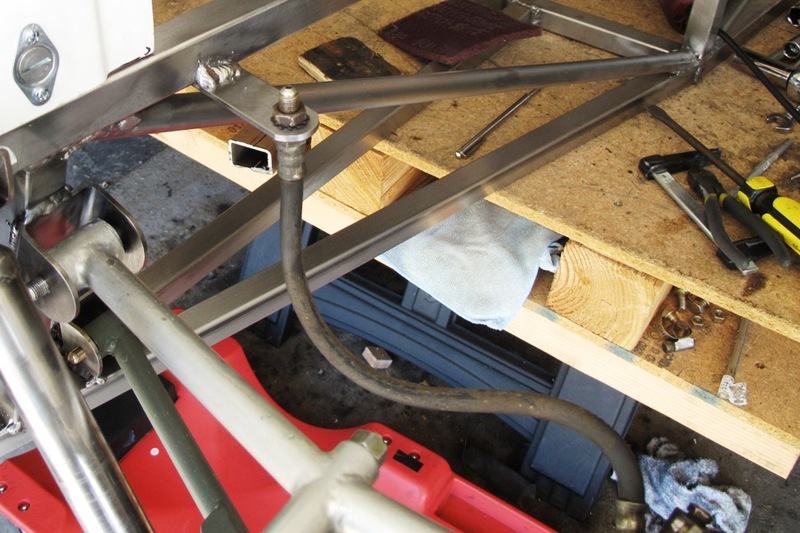 Once we welded the tabs in place we'd never be able to move the brake lines again. Ever. Unless we cut off the tabs and moved them, but we've done way too much of that lately and at some point it has to stop. The brake tab location is important because the flex lines have to articulate (a.k.a. 'bend') through the full range of suspension motion without stretching or going taut. In back this isn't much of a problem. 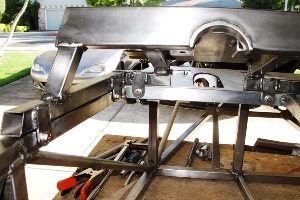 A single flex line runs from the rear axle to a fixed tab welded onto the O3 tube, which is part of the rear bulkhead. As the axle rises and falls in the frame, the flex line barely has to move. 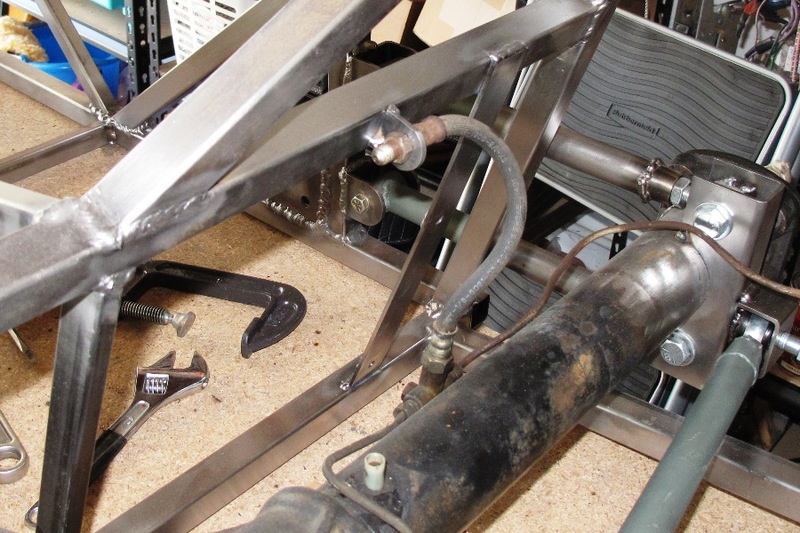 And the O3 tube is about the only thing back there that you can weld anything to, so that took most of the guesswork out of finding a location for the tab. Up front it was a different story. 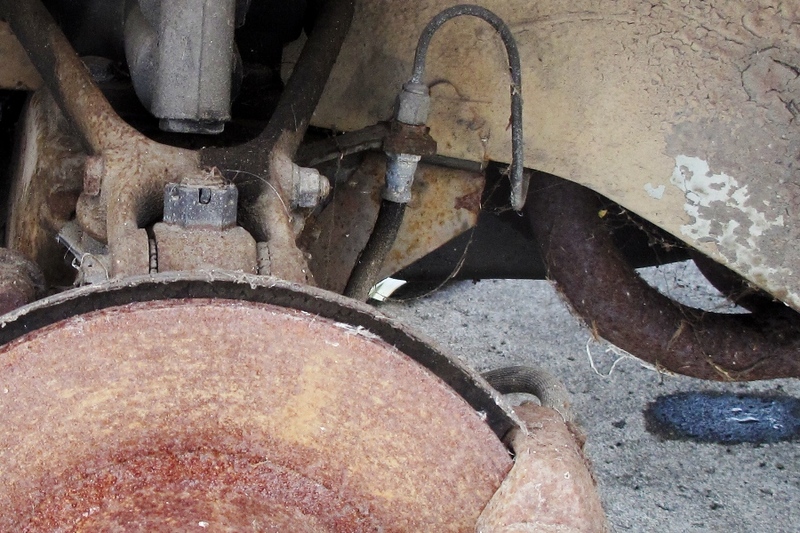 The flex line is attached at one end to the brake caliper, which not only has to move up and down, but also back and forth as the wheels steer left and right. While all this bouncing and steering is going on, the flex line also has to avoid the shocks and springs and A-arms and anything else that might be moving around in there. In the Locost book, the front attachment tab is inboard of the frame, between the upper and lower A-arms. That's a great place if it works on your Locost. On ours it's too far away. The stock MGB flex line won't reach that far. The real problem is the MGB caliper. On 100 out of 100 modern calipers, the flex line comes out of the inboard side of the caliper, and goes straight to the frame. On the MGB, the line comes out of the top of the caliper. And goes nowhere. 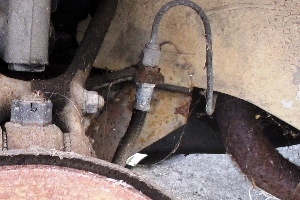 The brake tab on an MGB sits above and behind the A-arms. It's close to the top of the caliper and out of the way of everything. It's also well protected by the front fender. So it seems like the perfect place to mount the tab. Unfortunately, the same location on the Locost is hanging out in the slipstream, exposed to the wind and rain and any rocks and debris that happen to fly past. Still, it's our only real option unless we wanted to go through the hassle of ordering extra long custom flex lines, which would probably leak or not fit and have to be returned a bunch of times. The thing about decisions like these, you just have to make them, right or wrong. In the end you may never know for sure if you made the right call. If it works, it works, and the other way might've worked too, but you'll never know because you didn't do it that way. And if you did happen to make the wrong call, you'll find out sooner or later, and then you can fix it. But you can't waste too much time worrying about it beforehand. You have to make the call. So we welded on the tabs, and we're okay with them. I suppose we could've made the tabs a little longer, giving the flex line some more slack, but then the hard lines would have been sticking even farther out into the aforementioned slipstream, with all its rocks and debris and other stuff. In the end we actually like the way the tabs look sticking out like that. You may feel otherwise. But they're done now, and between the scuttle and the brake tabs we're two steps closer to our goal of a rolling chassis. That's 25 left to go if you're keeping score at home. With all these silly websites, such a great page keeps my inetrnet hope alive.